Nominations and Faculty Recommendations are two ways that ARC incorporates input from the Bates community as we select our cohort of ARC Peer Educators. Nominations can be submitted by anyone who is a part of the Bates community, at any point in time throughout the year. They give us a way to encourage prospective Peer Educators to apply for positions; learning that someone else on campus thinks they would make a good addition to ARC is frequently the piece of information that convinces someone to apply for a position. They tell us who to keep up to date with information about our hiring process. Nominations are not required in order to apply for any position within ARC. Faculty Recommendations are submitted by faculty who teach in the subject area that a student is applying to support. Faculty Recommendations are solicited by the applicant once their interview is complete, and we have a clear idea regarding what roles the student will be considered. 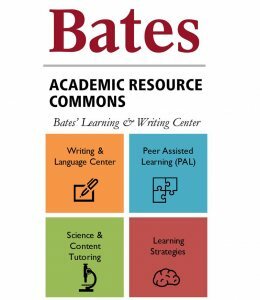 They are a way for us to ensure that the specific Bates faculty who are experts in the subject to be supported and involved in the subject’s instruction have input in our selection process. Seeking faculty recommendations in this manner is considered best practice among higher education learning centers throughout the country, and a necessary part of our program certification. Faculty Recommendations are required in order to be offered a position within ARC. Why do you keep them separate? Nominations are, by design, quick and easy to complete. For this part of our process, we want to cast as wide a net as possible. Faculty Recommendations are, by design, less quick and easy to complete. We ask for much more detailed information at this stage in order to help us make the best final hiring decision we can. Out of respect for our faculty’s time, we ask applicants to delay asking for recommendations until after their interview is complete, so that we can be sure they are still in the running.